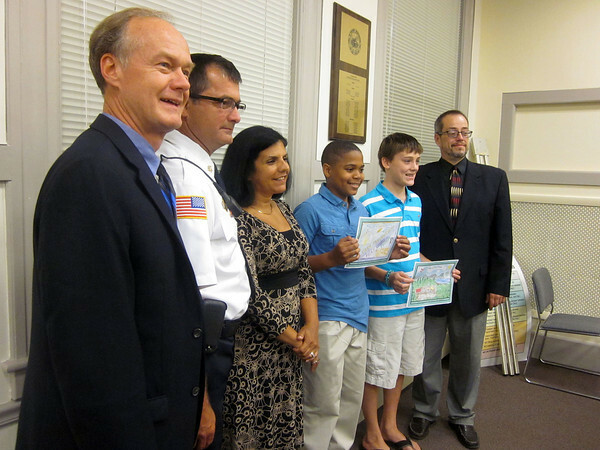 DANVERS: Holten Richmond Middle School students Jordan Henderson fourth from the left, and Ethan McGrath, second from the right, hold their winning Arson Watch Reward Program posters during a selectmen's meeting. With the students, are Town Manager Wayne Marquis, left, Fire Chief Kevin Farrell, Holten Richmond art teacher Siobhan McDonald and selectmen Chairman Gardner Trask, far right. Ethan Forman/staff photographer Sept. 3, 2013.